While Nitro Revival 3 is being billed as a "one day" event...that's not quite true. For you good folks in the know, we will be gathering at the track on Friday evening for a "not so secret" social...catered by In-N-Out. (10 bucks per meal) When you get to the gate, just tell 'em "Hook sent me!" Thanks to Bobby McLennan, the Champion Speed Shop Hospitality tent will be the gathering place. Best be there...as there's no telling who you are going to cross paths with! IRWINDALE, Calif.  The Jim McLennan Drag Racing Foundation, whose namesake was a mainstay of Northern California motorsports for more than four decades, will once again sponsor the Hospitality Welcome Center on Saturday, May 18th during the third installment of Steve Gibbss Nitro Revival event. The Jim McLennan Welcome Center will be the social centerpiece of a Nitro Revival event that features the cars and drivers, owners and mechanics who helped transform drag racing in the 1960s and 1970s. The Hospitality Center will be open to special guests including members of the International Drag Racing Hall of Fame. It also will be the site of autograph-signing sessions featuring Ed the Ace McCulloch, Jerry the King Ruth, Kelly Brown, Marvin Graham, Frank Bradley, Richard Tharp, TV Tommy Ivo, Red Greth, Butch Leal, Gary Beck, Roland Leong, Tom Hoover, Herm Petersen and Gentleman Joe Schubeck, among others. McLennan, who passed away in 2007 at the age of 74, just one month before his own induction into the Garlits-founded International Hall of Fame, was a racer, car builder, speed shop owner and track operator. In 1957 McLennan opened Half Moon Bay drag strip, leasing the runway used by a small coastal airport. The timing tower was on top of a bread truck and surplus military telephones provided the communications. At about the same time, he opened Champion Speed Shop in south San Francisco. A standout driver in a series of small block Chevies including the twin-engine Champion Speed Shop Special, McLennan was No. 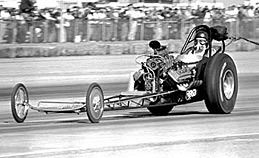 2 in the Drag News Top 10 standings for 10 months in 1961. He retired from active competition in 1963 and built a one-half mile oval track across the street from Candlestick Park, the one-time home of the San Francisco Giants. When the nostalgia movement began, he leapt at the opportunity to build replica versions of the two Champion Speed Shop cars he drove in the 1960s, the twin and a single engine car built by Kent Fuller. 04.09.2019: Event Producer Steve Gibbs is proud to announce that Emmy winning L.A. newscaster Gayle Anderson will be doing three of her patented live AM reports from Nitro Revival 3 at Irwindale Speedway and Event Center on Friday, May 17. They will air on KTLA Channel 5 with the purpose of promoting the action packed event on Saturday, May 18. 5:30am Gayle and cameramen arrive and set up equipment. 6:10am LIVE-Two minutes to three minutes of show and tell, viewer information. 8:10am LIVE-Two to three minutes of show and tell, viewer information. Gayle has been reporting for the KTLA - Channel 5 Morning News since 1993 and in that time has become a viewer-favorite due to her enthusiastic participatory style of reporting on unique, exciting and interesting stories in Southern California. Nitro Revival is right in her wheelhouse as its definitely unique and absolutely exciting. IRWINDALE, Calif. - The former chief starter at both Irwindale Raceway and San Gabriel Drag Strip, a TV star-turned-barnstorming drag racer, a couple of "hired guns" with long histories of straight-line success, the "granddaddy" of Top Fuel bike racing, Irwindale's "Mr. Unbeatable" and the master manipulator of the blown big block Chevy will share the spotlight May 18 during Nitro Revival 3 at Irwindale Dragway on the grounds of the Irwindale Speedway complex. 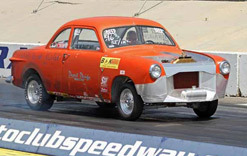 Tom Flenniken, "TV Tommy" Ivo, Gary Read, Gary Southern, Joe Smith, Carl Swift and Bubby Wilton will be recognized for their contributions during an era in which the San Gabriel Valley was at the center of drag racing's development as a major American motor sport. Featuring historic race cars, unique hot rods and the men and women who gave them their personalities, Nitro Revival 3 will include a wide variety of exhibition runs, continuous rolling push starts of historic vehicles that were emblematic of the era, static displays, the always popular Hook's Hot Rod Hangout and a climactic Line of Fire, the simultaneous "fire-up" of vintage dragsters, altered and Funny Cars that has become the traditional finale. 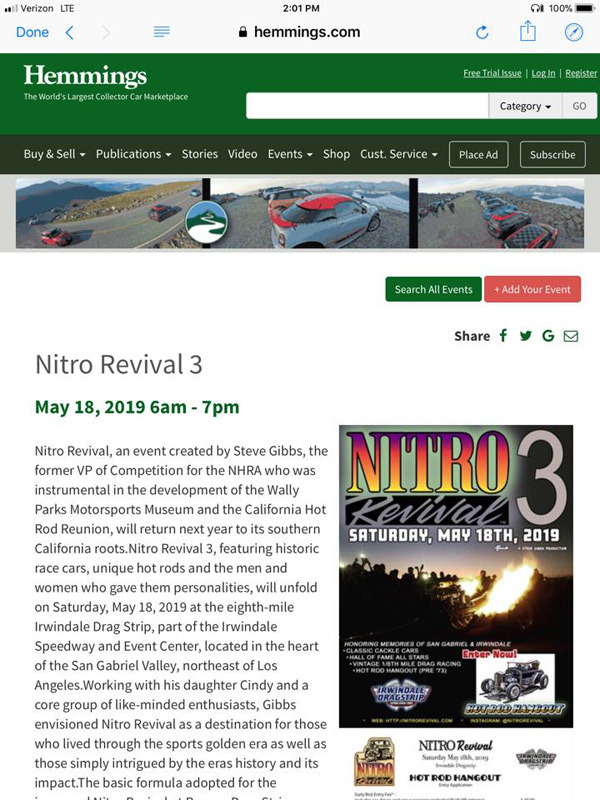 "Nitro Revival brings back the sights and sounds of the early days of hot rodding," said the event's founder, former NHRA Competition Director Steve Gibbs, "but it also serves as a reunion for racers from that era and it lets fans experience a drag racing museum come to life." Each of the honorees will be presented custom plaques during an afternoon recognition ceremony, courtesy of Jerry and Pat Baltes, staunch Nitro Revival supporters. Widely known as "Flanagan," was the starter at the two tracks on which the Revival spotlight will shine most brightly. 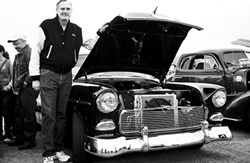 A retired police officer and former president of the Cal Rods Car Club, he has spent his lifetime building and racing hot rods, starting with a 1931 Ford A model coupe in the 1950s and including a more recently restored 1948 Ford pickup that includes a low boost supercharger built by Top Fuel and Top Gas veteran Don Hampton to allow it to be driven on the street. Ivo, of course, needs little introduction. After making a name for himself in television shows like "Margie," "I Remember Mama" and "The Donna Reed Show," he turned his attention and resources to drag racing. Much of his early racing career centered around San Gabe where, on Oct. 24, 1962, he became the first to break the 8.00 second barrier at the wheel of the car he called "Barnstormer." 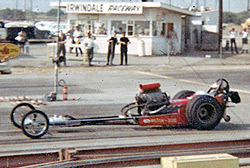 He also debuted his radical four-engine dragster "Showboat" at San Gabriel. Although it was relegated to "exhibition" status by the NHRA, it nevertheless helped to further cement Ivo's status in the sport and figured into his 2005 induction into the Motorsports Hall of Fame of America now housed at Daytona Beach, Fla.
Read's reputation for being able to drive anything on wheels and do it better than most earned him rides in some of the West Coast's most celebrated vehicles. A member of the legendary "Groundshakers," he successfully campaigned the "Dago Red" and Genuine Suspension Top Fuel dragsters, the Haight and Sullivan fuel altered and the aptly-named "Nutcracker" AMC Javelin Funny Car, among others. Like Read, Southern distinguished himself through his versatility, competing at some time at every level including Top Fuel and Funny Car. 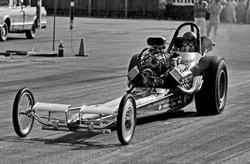 The defining moment of his long career was his victory at the 1988 U.S. Nationals in Dale Smart's Top Alcohol dragster outfitted with the revolutionary Norm Drazy-designed PSI screw blower. In 1981, he was runner-up at Indy in Top Alcohol Dragster and a month later was runner-up at the World Finals at OCIR in Top Alcohol Funny Car. He also drove "The Stinger" Funny Car and John Lindsay's "Impulse" Vega. Smith began his fuel motorcycle racing career at San Gabriel in the 1950s and almost ended it at Irwindale in 1967 when he was pitched off at 145 miles per hour, preceding his bike across the finish line. He ultimately dominated fuel bike racing on a series of Harley motorcycles in the 1970s, winning the U.S. Nationals at Indianapolis in 1971, 1974 and 1975 and earning runner-up honors in 1973. He was the first to break the 9.00 second barrier on a motorcycle when he ran 8.97 at Bakersfield astride his Shovelhead-powered "King Rat" Harley. Later, he built the twin-engined Double King Rat on which he crashed in Kentucky in 1975 after one of the engines exploded and blew him off the bike, effectively ending his career. Swift may be one of the most incredible drag racing success stories nobody knows. After a motorcycle accident as a youngster, he encountered discrimination in the workplace and elsewhere because of his prosthetic wooden leg. Despite that handicap, he became one of the most prolific racers of his era at the wheel of a stick shift 1951 Ford coupe with flathead power that he called the "Poor Boy's Thunderbolt." He had won 150 trophies before they started bracket racing for money at Irwindale in 1966. In 1967, he won 17 races and dominated the track's "King of the Hill" weekly tournament. He was so dominant during that span that Drag News referred to him as "Mr. Unbeatable." Wilton's engines excelled on both land and water. He and partner Del Doss had the baddest big block Chevy on the West Coast in the mid-1960s, a car he later restored to its original form for cackle events. He also partnered with Kenny Ellis in the "Trigster," a three-wheeled Top Fuel dragster built by Scotty Fenn but banned by the NHRA. As a result, it raced only at non-NHRA tracks including San Gabriel and won the B/Gas trophy at the March Meet at Bakersfield in 1961. Wilton later built blown Chevies for circle and straight-line boat racing. Thanks to all who requested in a timely matter and apologies to those who were denied. 03.25.2019: Event Producer Steve Gibbs is proud to announce that Nitro Revival will be featuring four of the best Nostalgia Top Fuel Dragsters on the planet for autographs and exhibition runs. They include 2018 NHRA Hot Rod Heritage Racing Top Fuel Champion Mendy Fry and the High Speed Motorsports record holding dragster. 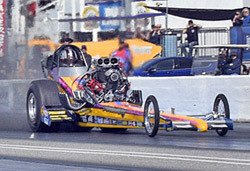 Also visit with 2019 March Meet Top Fuel Champion, Adam Sorokin and the Champion Speed shop car. The four car show will be filled out by Brendan Murry in his "Running Wild" fueler and Rick White in the Neal & White car. 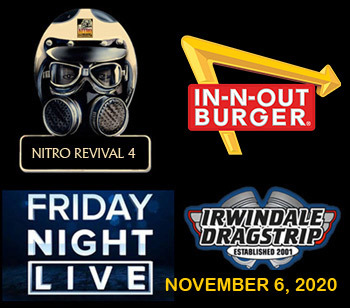 IRWINDALE, California (October 29, 2018) - Nitro Revival, an event created by Steve Gibbs, the former VP of Competition for the NHRA who was instrumental in the development of the Wally Parks Motorsports Museum and the California Hot Rod Reunion, will return next year to its southern California roots. Nitro Revival 3, featuring historic race cars, unique hot rods and the men and women who gave them personalities, will unfold on Saturday, May 18, 2019 at the Irwindale Speedway and Event Center located in the heart of the San Gabriel Valley, northeast of Los Angeles. 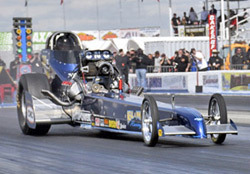 Working with his daughter Cindy and a core group of like-minded enthusiasts, Gibbs envisioned Nitro Revival as a "destination" for those who lived through the sport's "golden era" as well as those simply intrigued by the era's history and its impact. 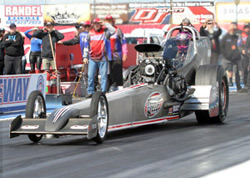 The basic formula adopted for the inaugural Nitro Revival at Barona Drag Strip near San Diego and extended for last year's event at Weather Tech Raceway at Laguna Seca, two hours south of San Francisco, again will serve as the model. That means plenty of static displays featuring authentic and recreated period race cars including front-motored Top Fuel dragsters, fuel altereds and Funny Cars. Highlights will include a trip to Hook's Hot Rod Hangout featuring period hot rods and street rods, continuous rolling push starts emblematic of the era and, finally, the Line of Fire, the simultaneous "fire-up" of vintage dragsters, altereds and Funny Cars that serves as the finale. 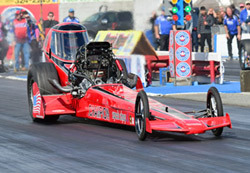 A full schedule of exhibition runs by early style drag racing cars and motorcycles will be featured on the Irwindale eighth mile strip. In addition, there will be a special focus on the racetracks, race cars and racers that were active in the area during the 1960s and 1970s with particular emphasis on San Gabriel Drag Strip and the old Irwindale Raceway, both of which operated in close proximity to the current Irwindale Drag Strip. "We really want this to be a gathering of the drag racing clans," said Gibbs, including followers of all of the bygone Southern California tracks, such as Lions, Pomona, Santa Ana, Fontana, San Fernando, Colton, Carlsbad. "We have such a rich history and legacy to draw from." Numerous International Drag Racing Hall of Fame members are expected to attend. Gibbs spent 48 years at the NHRA where he served first as Advertising Director of National Dragster before later acquiring the nickname "Mr. Traction" for his work as Competition Director and later, VP of Competition. Earlier this year, he was honored by the British Drag Racing Hall of Fame which presented him with its Global Achievement Award for his efforts in advancing the sport worldwide. "Nitro Revival brings back the sights and sounds of the early days of hot rodding," Gibbs said, "but it also serves as a reunion for racers from that era and it lets fans from every era experience a drag racing museum come to life. We loved the experiences at Barona and Laguna Seca, but we're excited about coming to Irwindale." Event, Sponsor, Vendor and Participant information will be added here as confirmed. 2018 LAGUNA SECA COVERAGE - 8 pages!